A sensational pair of mid-18th century carved stone finials, pineapples from France. 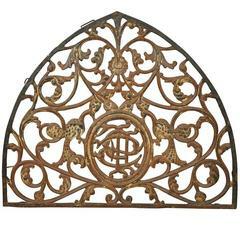 These wonderful architectural elements are presented on iron stands. Terrific accent pieces for a mantel, table top or converted into lamps. 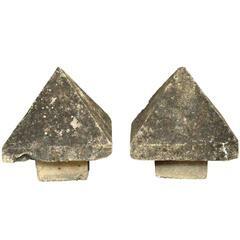 A pair of mid-19th century Primitive stone capitals from Spain. Wonderful as a garden accent or for the interior. 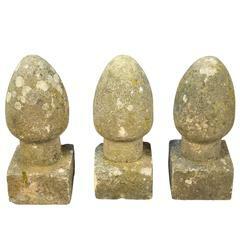 A very handsome pair of mid-19th century carved stone finial capitals from Spain. Wonderful accents for any entrance or driveway - also terrific as interior accents. A beautiful antique piece, this bell originates from Spain, circa1700s. Measurements: Bell alone 14'' D x 14'' H Bell w/ arm 24.5'' D x 23.5'' H.
Noble coat of arms in stone, effigy depicting "Wolf and acorn", Italy, 18th century.